Not the first feminist figure in comics (Pansy Potter and Beryl the Peril both predate her), Minnie the Minx is, however, the most famous. Her distinctive look was a deliberate attempt at branding... like a wasp's yellow and black strips spell danger, the red and black striped jumper signifies that havoc is about to be wrought, chaos about to descend and teachers, parents, softies – indeed boys in general – are about to be menaced. 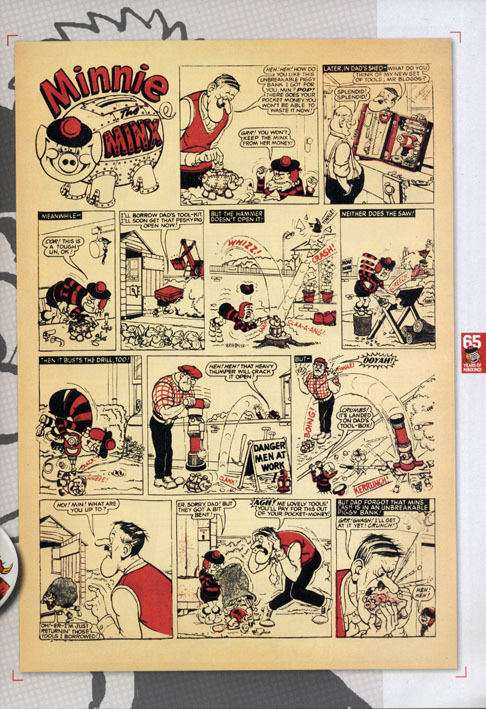 Two years after Dennis the Menace appeared in The Beano, editor George Moonie was keen to introduce a female character with a similar anti-authoritarian streak and his choice of artist was Leo Baxendale, then enjoying his first success with Little Plum. Baxendale wanted to create an Amazon warrior of a girl, wildly slapstick and utterly anarchic. What set her aside was her desire to win at any cost. She had the will-power and a laser-like focus on getting what she wanted and beware anyone who got in her way or tried to thwart her desires. Usually that was mum and dad, but anyone from the local bobby on his beat to a neighbour in the wrong place at the wrong time, would be bowled over by this one-girl stampede. 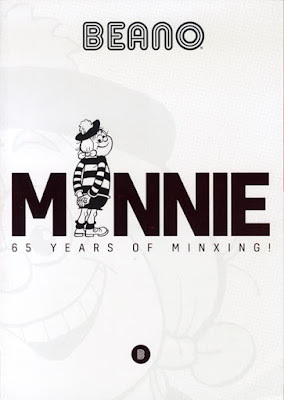 Minnie: 65 Years Of Minxing is a 64-page 'bookazine' filled with memories of minxing days gone by, beginning with a look at Minnie's origins. 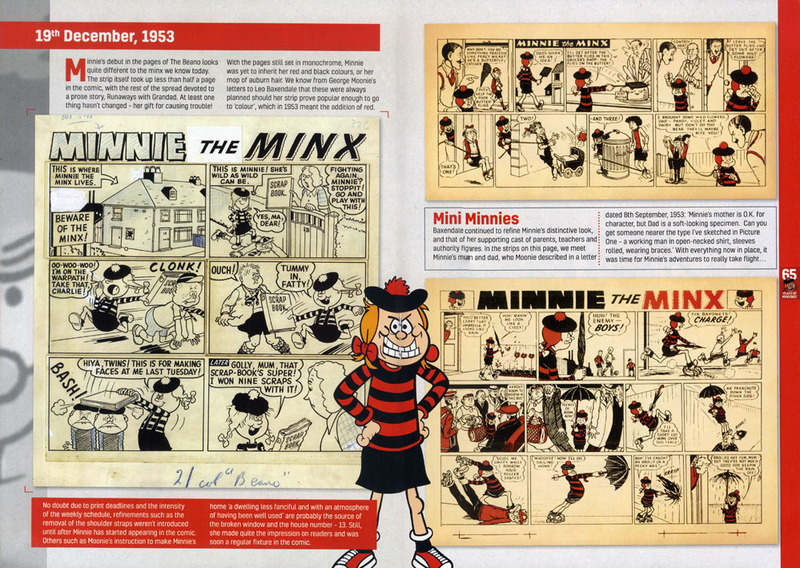 There's a reprint of the very first Minnie strip – published in The Beano for 19 December 1953 – the image taken from the original art board. Minnie started as a half page, switching to a full page later that decade and then, in 1970, to two pages. We are introduced to Minnie's artists: Leo Baxendale (1953-62), Jim Petrie (1961-2001), Tom Paterson (2001-08), Ken Harrison (2008-12), Nigel Parkinson (2012-16), Paul Palmer (2016-18) and Laura Howell (2018- ). Along the way we also learn what a Minnie script looks like, learn how to draw Minnie, look at some of the famous faces that have appeared in her stories and meet some of the female artists inspired by Minnie's adventures. In between, there are almost two dozen strips from across Minnie's sixty-five years to remind us why we love her. Thomsons always make a good job of this kind of celebratory magazine. What I especially like are the unique items that readers would never otherwise get to see: the original art board for the first strip, a Jim Petrie try-out for a solo Minnie comic and Laura Howell's try-out which earned her the position of Minnie's current artist. This is gold dust to collectors and long may DC Thomson continue to celebrate their classic characters. Bash Street Kids turns 65 next year... just saying. Minnie: 65 Years of Minxing, edited by John Anderson. D. C. Thomson, October 2018, £6.99. Gnasher turned 50 back in August.